Formerly “Pintuyan Beach Resort” is located on Panao Island (about 15min. per car from San Ricardo Ferry Port) in Southern Leyte and under the direction of the German Ralf Jockel. All bungalows have ocean view, CR, shower with hot water, Fan, aircon and european (german) outlets (no need to have adapter). 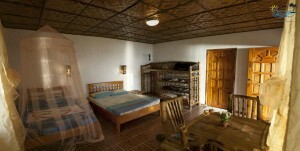 The Pintuyan Dive Resort offers full board accommodation at an affordable price. One of the dive highlights there is diving with whale sharks! They can be seen almost the whole year around, even on the housereef. 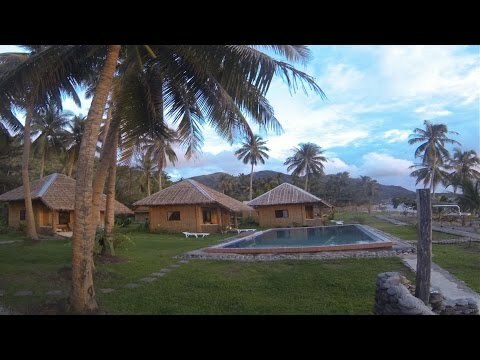 The Pintuyan Dive Resort was not affected by the typhoon and everything is fully functionally. 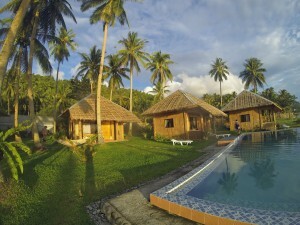 Leyte Dive Resort is a popular choice amongst travelers in Southern Leyte, whether exploring or just passing through. The hotel offers guests a range of services and amenities designed to provide comfort and convenience. Laundry service/dry cleaning, safety deposit boxes, pets allowed, restaurant, car park are just some of the facilities on offer. Guestrooms are fitted with all the amenities you need for a good night’s sleep, including air conditioning, desk, balcony/terrace, shower, satellite/cable TV. Access to the hotel’s massage, garden, water sports (non-motorized), private beach will further enhance your satisfying stay. A welcoming atmosphere and excellent service are what you can expect during your stay at Leyte Dive Resort. Leyte Dive Resort offers great muck diving for macro enthusiast at our local dive sites. But also there is wonderful wall and drift diving with beautiful hard and soft corals, visibility is good year round. We also have excellent night diving at Malitbog Pier and the house dive site. We also offer Whale Shark Tour which you’ll be able to swim with the gentle giant of the sea.The Dive Resort is located on the shore of Sogod Bay. Michael’s Resort and Dive is a popular choice amongst travelers in Southern Leyte, whether exploring or just passing through. The hotel offers a wide range of amenities and perks to ensure you have a great time. All the necessary facilities, including restaurant, room service, bar/pub, bicycle rental, shuttle service, are at hand. Designed for comfort, guestrooms offer complimentary bottled water, shower, internet access – wireless (complimentary), air conditioning, extra long beds (> 2 meters) to ensure a restful night. Enjoy the hotel’s recreational facilities, including massage, garden, before retiring to your room for a well-deserved rest. Michael’s Resort and Dive is an excellent choice from which to explore Southern Leyte or to simply relax and rejuvenate. The 3-star Dona Marta Boutique Hotel offers comfort and convenience whether you’re on business or holiday in Southern Leyte. The hotel offers a high standard of service and amenities to suit the individual needs of all travelers. All the necessary facilities, including concierge, family room, Wi-Fi in public areas, room service, meeting facilities, are at hand. Guestrooms are designed to provide an optimal level of comfort with welcoming decor and convenient amenities like satellite/cable TV, coffee/tea maker, internet access – wireless, in room video games, private pool. Access to the hotel’s garden, massage, outdoor pool, private beach, jacuzzi will further enhance your satisfying stay. Convenience and comfort makes Dona Marta Boutique Hotel the perfect choice for your stay in Southern Leyte. Silago Tourist Inns is a popular choice amongst travelers in Southern Leyte, whether exploring or just passing through. The hotel has everything you need for a comfortable stay. 24hr room service, airport transfer, safety deposit boxes, bar/pub, babysitting are just some of the facilities on offer. The well-appointed guestrooms feature television, microwave, mini bar, shared bathroom, fan. Enjoy the hotel’s recreational facilities, including tennis courts, private beach, massage, water sports (non-motorized), garden, before retiring to your room for a well-deserved rest. Convenience and comfort makes Silago Tourist Inns the perfect choice for your stay in Southern Leyte. Ideally located in the prime touristic area of Maasin, Jaimee’s Hotel promises a relaxing and wonderful visit. The property features a wide range of facilities to make your stay a pleasant experience. Facilities like bar/pub, shops, airport transfer, concierge, restaurant are readily available for you to enjoy. Each guestroom is elegantly furnished and equipped with handy amenities. Access to the hotel’s fitness center, private beach, jacuzzi, garden, outdoor pool will further enhance your satisfying stay. Friendly staff, great facilities and close proximity to all that Southern Leyte has to offer are three great reasons you should stay at Jaimee’s Hotel. GV Hotel Maasin (Southern Leyte) is conveniently located in the popular Maasin area. The hotel has everything you need for a comfortable stay. All the necessary facilities, including car park, are at hand. Guestrooms are designed to provide an optimal level of comfort with welcoming decor and convenient amenities like fan, desk, shower, air conditioning, television. The hotel offers various recreational opportunities. For reliable service and professional staff, GV Hotel Maasin (Southern Leyte) caters to your needs. Ideally located in the prime touristic area of Sogod, GV Hotel Sogod (Southern Leyte) promises a relaxing and wonderful visit. Featuring a complete list of amenities, guests will find their stay at the property a comfortable one. Service-minded staff will welcome and guide you at the GV Hotel Sogod (Southern Leyte). Guestrooms are designed to provide an optimal level of comfort with welcoming decor and convenient amenities like desk, television, fan, shower, air conditioning. The hotel offers various recreational opportunities. Convenience and comfort makes GV Hotel Sogod (Southern Leyte) the perfect choice for your stay in Southern Leyte. Located in Maasin, Caimito Beach Hotel is a perfect starting point from which to explore Southern Leyte. Both business travelers and tourists can enjoy the hotel’s facilities and services. All the necessary facilities, including room service, babysitting, Wi-Fi in public areas, car park, executive floor, are at hand. Each guestroom is elegantly furnished and equipped with handy amenities. Enjoy the hotel’s recreational facilities, including private beach, outdoor pool, jacuzzi, water sports (non-motorized), garden, before retiring to your room for a well-deserved rest. Convenience and comfort makes Caimito Beach Hotel the perfect choice for your stay in Southern Leyte. Set in a prime location of Southern Leyte, Sogod Bay Scuba Resort – Apartments puts everything the city has to offer just outside your doorstep. Featuring a complete list of amenities, guests will find their stay at the property a comfortable one. Service-minded staff will welcome and guide you at the Sogod Bay Scuba Resort – Apartments. The well-appointed guestrooms feature satellite/cable TV, mini bar, television, balcony/terrace, coffee/tea maker. Recuperate from a full day of sightseeing in the comfort of your room or take advantage of the hotel’s recreational facilities, including garden, water sports (non-motorized). Convenience and comfort makes Sogod Bay Scuba Resort – Apartments the perfect choice for your stay in Southern Leyte.